We develop and produce water treatment systems that recycle wastewater, focusing on environment, economy and quality. Envotherm has units that can clean waste water from 50 l/h to 10 m3/h. We have made customised units for different sectors. We can recycle waste water which contains oil, heavy metals, radioactive water and much more. 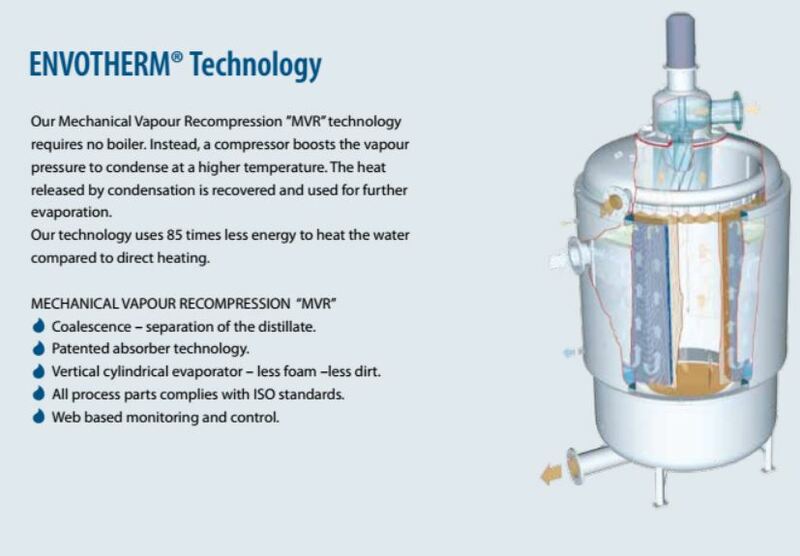 Through the technology E·MVR (Envotherm – Mechanical Vapor Recompression) we evaporate the water out of the wastewater. The result is distillated water – up to 95% that can be reused in the production. Transport of polluted waste water is reduced from for example 10 transports to one transport a week. This saves CO2 and reduces traffic. We reuse the energy from the steam to warm the incoming wastewater. This makes the energy consumption as low as 45 kWh per recycled m3 wastewater. Envotherm has a newly designed concept, where the units can be leased, and after end use the unit return to Envotherm. The customer pays per cleaned m3 waste water. We reuse up to 80% of the Stainless steel in the unit for new units. The Customer saves money from day one – the solution is positive for the customer’s cashflow – it is flexible if the demand for recycling more/or less waste water varies. The main challenges are that in some states the local community demands that the customer is certified to handle waste water. When using the leasing model – the challenge is that the legal rules are different. In Denmark, it is custom that it is the customer who is responsible for the insurance of the leased unit. In Germany, it is the supplier. In Denmark, if the customer does not pay the monthly agreed amount, the supplier can pick up the unit. In Germany, this issue must go through court and it may take several years before you as a supplier either get your receivable or your unit back. Both examples make sales in the EU difficult.